The Indigenous People of Biafra (IPOB), Mbaise chapter, on the 24th September, 2016 paid a solidarity visit to Nnamdi Kanu's Family in Afaraukwu Ibeku, Umuahia in Biafra land. Present in the palace were the king, Eze Israel Kanu, the wife, Ugoeze Kanu, and the son, Emmanuel Kanu and other family relatives and well-wishers. Recall that the Biafran war veteran and greatly respected leader of Biafra, Col. Chukwemeka Odumegwu Ojukwu declared the sovereign state of Biafra in Mbaise after consultations and meetings in Enugu Biafra land. Hence Mbaise people home and abroad are on the forefront of the restoration struggle to achieve what was declared in their land. And in 2006, Nnamdi Kanu met with Mbaise people to discuss the way forward on the Biafra restoration agenda. Giving their unreserved support Nnamdi Kanu boldly left back to London. Now Mbaise people have sent their delegates to reiterate their commitment and support for the Biafran struggle and Nnamdi Kanu. Present from Mbaise IPOB were representatives from the three local government areas, Ahiazu, Aboh and Ezinihitte Mbaise LGAs. Introducing the Mbaise delegates, Mazi Igbokwe from Obowo, briefed the king that he accompanied Mbaise, his brothers, in their solidarity visit. Speaking on behalf of the Mbaise IPOB, Mazi Ekwueme Ahaneku from Ahiazu LGA told the king and his family that they and Mbaise are in-laws and therefore would never abandon them in the struggle. In his words he said, "An in-law to a person is actually his brother." "A he-goat is not happy with the battle against his she-goat....therefore we, Mbaise people, have come to show and tell His Royal Highness and his entire family that we are fully supportive of Nnamdi Kanu and loyal to his family both in the day and in the night and in no distant time victory will be ours." "Mbaise people will never draw back in backing up our Director and his family." Adding to the solidarity speech, a delegate from Ezinihitte, Elder Paul Nwogu summarized his commitment and dedication in the Biafran struggle and how he had never and would never slack. Adding his voice, Nnanyiukwu Anyanwu, a Biafran elder and veteran said, "Chukwu Okike Abiama said he has people. There are people fighting the physical battle while we are fighting the spiritual one." "There is no Wednesday that I sleep in my house (I'm always awake praying for Nnamdi Kanu and Biafra)." "That Chukwu Okike Abiama who promised us victory has fought our battle and we have won. And we(Mbaise people) are telling you( Eze and your entire family) that we are with you." Responding to the visit, His Royal Highness, Eze Israel Kanu expressed his happiness and recalled how he shared relief materials in Mbaise during the Biafran war. And that apart from being an in-law to Mbaise, he loves Mbaise so much because of their goodness to him. He urged Mbaise people to hold on to the good they are known for, and that God would reward them as he (Eze) would always remember them for their support and hard work. In his own words, "I thank you all for coming to see me." "During the Biafra war, I journey down to Mbaise to share relief materials before it was declared that the war has ended." "Hold unto your good and I will never forsake you, Mbaise people." 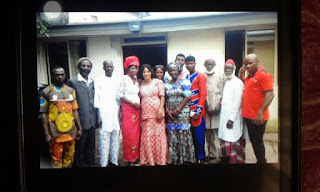 Expressing gratitude, Ugoeze, the Queen of Afaraukwu Ibeku welcomed Mbaise delegates but worried why she was not pre-informed, at least to enable her to prepare well for her in-laws. But nevertheless, she displayed her kitchen prowess...because "mgberede ka-eji amara dike; mgberede nyirikwa dike" meaning "Suddenness conquers a great one; and suddenness projects a great one.